The use of the contents of the website is under the users own risk. By using the Website, there is no actual contractual relation between the user and the offerer. To that extent also no contractual or quasi-contractual obligations result against the provider. The customer must be at least 18 years old to be able to place an order of the trading system at the Forex Diamond website. To be able to use the offer by Forex Diamond, the client must provide the minimum necessary system requirements and their correct functionality at their own cost. Forex Diamond makes clear thereupon that the system requiremetns can change according to the technical development. You understand that you should be aware that trading Foreign Exchange carries a high level of risk, and you can lose some or all of your investment. The high degree of leverage that is often obtainable in forex trading, can work against you as well as for you. The use of leverage can lead to large losses as well as large gains. You must be aware of the risks and be willing to accept them in order to invest in the futures and options markets. Do not trade with money you cant afford to lose. You understand and agree that we will not be liable or responsible for any loss or damage due to any reason. By using Forex Diamond, you acknowledge that you are familiar with these risks and that you are solely responsible for the outcomes of your decisions. We accept no liability whatsoever for any direct or consequential loss arising from the use of this product. You understand and agree that past results are not necessarily indicative of future performance. You must not use our website in any way that causes, or may cause, damage to the website or impairment of the availability or accessibility of the website, or in any way which is unlawful, illegal, fraudulent or harmful, or in connection with any unlawful, illegal, fraudulent or harmful purpose or activity. The operator of the Website does not take responsibility for the performance of external factos, like, for example, the availability of the Web servers, power failures or performance of the brokers, on which we have no influence. Should financial or personal losses and/or financial damage ocurr due to such events, we cannot be held responsible for them. Despite careful research and throughtful supply of all the information, we are not responsible for any possible failure. This agreement concerns a trading system which we offer in form of a software (Expert Advisor), indicators, templates etc. We take over expressly no responsibility for our products. Should the customer trade a value or a product through our trading system at any market e.g. Foreign exchange market, it will be done by his/her own decisions and under his/her own responsibility. The owner does not take responsibility for possible losses at the foreign exchange markets or other investments. With the purchase of the automated trading system, the customer agrees that he was informed by us expressly about the risks. We recommend to always test the trading system beforehand on a demo account and afterwards, the Customer should decide whether the tradings system should trade for real. Access to certain areas of our website is restricted. We reserve the right to restrict access to areas of our website, or indeed our whole website, at our discretion. If we provide you with a user ID and password to enable you to access restricted areas of our website or other content or services, you must ensure that that user ID and password is kept confidential. We may disable your user ID and password in our sole discretion without notice or explanation. We take the protection of your data very seriously. Mailadressen, names and all further personal information are absolutely confidentially treated by us and used only for internal purposes. Sharing your data to any other entieies is hereby excluded. Basically, the software must be paid in advance. Several methods of payment are offered to the Customer. For delivery of the goods, the prices described in our webpage apply. The offered product is made available as download (after payment). Forex Diamond website expects its partners, advertisers and affiliates to respect the privacy of our users. Be aware, however, that third parties, including our partners, advertisers, affiliates and other content providers accessible through our site, may have their own privacy and data collection policies and practices. For example, during your visit to our site you might click a link to, or view as part of a frame, page, certain content that is actually created or hosted by a third party. Also, through this website you may be introduced to, or be able to access, information, Web sites, features offered by other parties. This website is not responsible for the actions or policies of such third parties. You should check the applicable privacy policies of those third parties when providing information on a feature or page operated by a third party. The entire contents of the Site are protected by international copyright and trademark laws. The owner of the copyrights and trademarks is the Forex Diamond team. You may not modify, copy, reproduce, republish, upload, post, transmit, or distribute, in any manner, the material on the site, including text, graphics, code and/or software. You may print and download portions of material from the different areas of the Site solely for your own non-commercial use provided that you agree not to change or delete any copyright or proprietary notices from the materials. 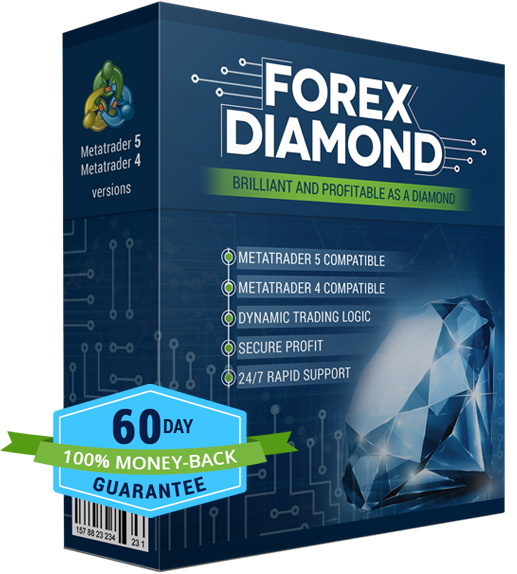 With your purchase of Forex Diamond you understand and agree that the 60 days no questions money back guarantee is valid within 60 days after the purchase. Any refund requests after this period will be rejected. Our company reserves the right to ask customers to confirm their refund request. If the customer does not confirm it within 3 calendar days, then the refund request is considered as invalid and it is annulled. The Additional Licenses do not have a money-back guarantee. Customers, who have purchased Forex Diamond for the second time, after they have already been refunded once, cannot be refunded again - since a second purchase of the product is made, we consider that the customer is happy with the product. You understand and agree that if you share your account numbers with third-party users for any purpose, we reserve the right to stop our service for you. By purchasing The Forex Diamond and agreeing to these terms, you agree to receive all communications from The Forex Diamond via the World Wide Web or e-mail. This will include, but not necessarily be limited to, confirmations of transactions, Purchase statements, financial statements, notices of modifications to The Forex Diamond's terms, and other basic communications. Communications sent to your e-mail address or provided through the web site must be retrieved and read promptly. All communications sent by The Forex Diamond by any means will be deemed to have been received by you. You agree to advise us promptly of any changes to your e-mail and/or mailing address. You agree to advise Forex Diamond promptly of any errors or omissions in any transaction or in the handling of your Purchase. Failure to provide prompt notice of any errors will be deemed to constitute acceptance of the accuracy of all information sent to you. In these terms and conditions, "your user content" means material (including without limitation text, images, audio material, video material and audio-visual material) that you submit to our website, for whatever purpose. You grant to us a worldwide, irrevocable, non-exclusive, royalty-free license to use, reproduce, adapt, publish, translate and distribute your user content in any existing or future media. You also grant to us the right to sub-license these rights, and the right to bring an action for infringement of these rights. Your user content must not be illegal or unlawful, must not infringe any third party's legal rights, and must not be capable of giving rise to legal action whether against you or us or a third party (in each case under any applicable law). You must not submit any user content to the website that is or has ever been the subject of any threatened or actual legal proceedings or other similar complaint. We reserve the right to edit or remove any material submitted to our website, or stored on our servers, or hosted or published upon our website. Notwithstanding our rights under these terms and conditions in relation to user content, we do not undertake to monitor the submission of such content to, or the publication of such content on, our website. Forex Diamond reserves the right to update and change the Terms from time to time without notice. Any new features that augment or enhance the current Service, including the release of new tools and resources, shall be subject to the Terms. Continued use of the website and/or guide after any such changes shall constitute your consent to such changes.